If you’re shepherding your little witches, goblins, and ghouls through the urban jungle for the first time, take a tip from a Mom who knows—Liz Libre from Linda and Harriett. Her hand-illustrated invitations and artwork are beautiful accompaniments to all the little parties in family life, and we knew she’d have some great advice for your Halloween plans. How do you typically celebrate Halloween at your house? We live in a big apartment building, so we usually only go trick or treating in our building— starting at the top floor and working our way down. It’s very different than the way my husband and I grew up trick or treating but it’s kind of amazing for the kids to not have to wear a giant coat over their costumes! What’s your favorite Halloween crafting project? I’m on the committee in our apartment building that plans a Halloween party. We always do a simple craft for all aged kids. Last year, we did a create-your-own monster craft. It was easy enough for younger kids to assemble (glue the assorted craft materials and pieces together and voila, it’s done) and interesting enough for the older kids to add smaller details like crooked eyebrows and jagged teeth. 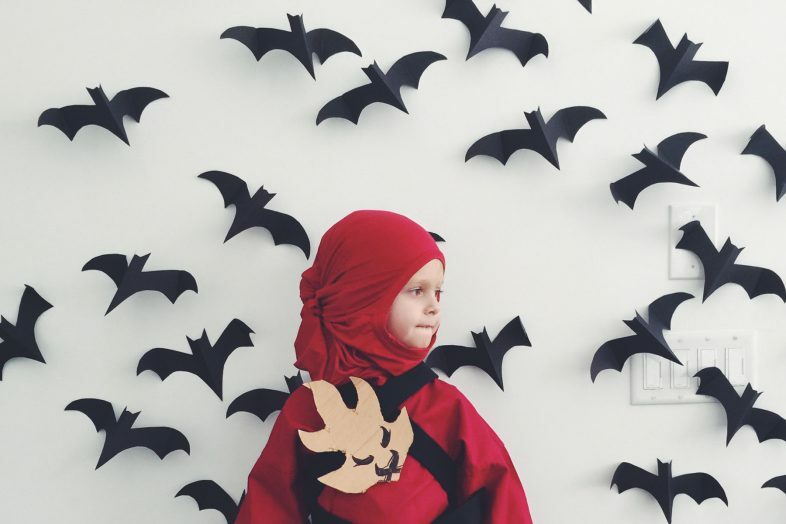 And for the past two years, I’ve made a paper bat backdrop that is simple and easy for setting the tone and perfect for taking photos! What’s your favorite Halloween item to purchase? Pumpkin picking is my favorite thing to do around Halloween. My mom grew up on a farm that sold pumpkins, so it reminds me of going to the farm when I was little. The kids pick their own small pumpkins and then we carve one big one. We light it every night leading up to Halloween and dim the lights. It’s just enough spookiness. What’s the most difficult Halloween costume you’ve had to conjure up for a little one? It wasn’t particularly difficult, but it was handmade and the coolest. 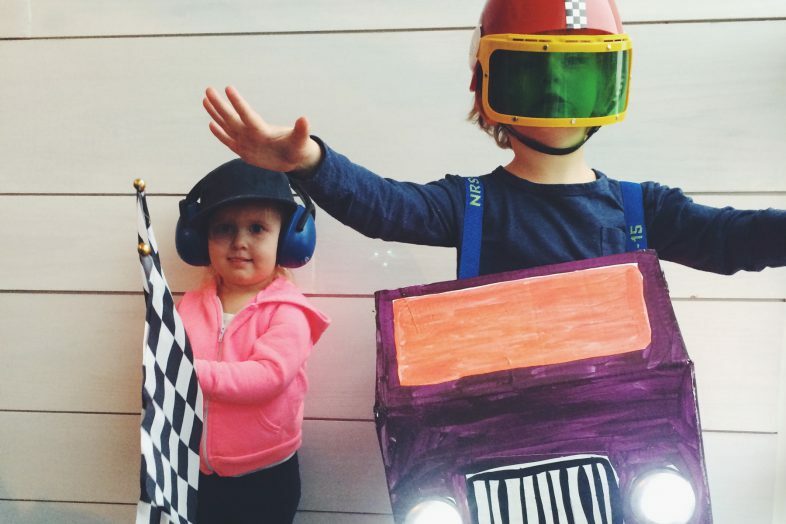 A couple years ago, my artist friend and I made our boys race car costumes out of boxes. We used straps as suspenders to keep the boxes on their little bodies and got them little helmets with eye shields. My husband had the genius idea of using stick on battery-operated lights as headlights. Louise, who is two years younger, was the Finish Flag operator who wore headphones and carried a checkered flag. I don’t think we’ll top that costume. What is your personal halloween look? My Halloween look is my everyday look. I’m always so involved in planning everyone else’s costume and craft projects, so I prefer to just be Mom. Candy that I find the day before at the drugstore. Our local drug store starts stocking Halloween candy in early September (technically still summer!) and yet I’m always purchasing it last minute. 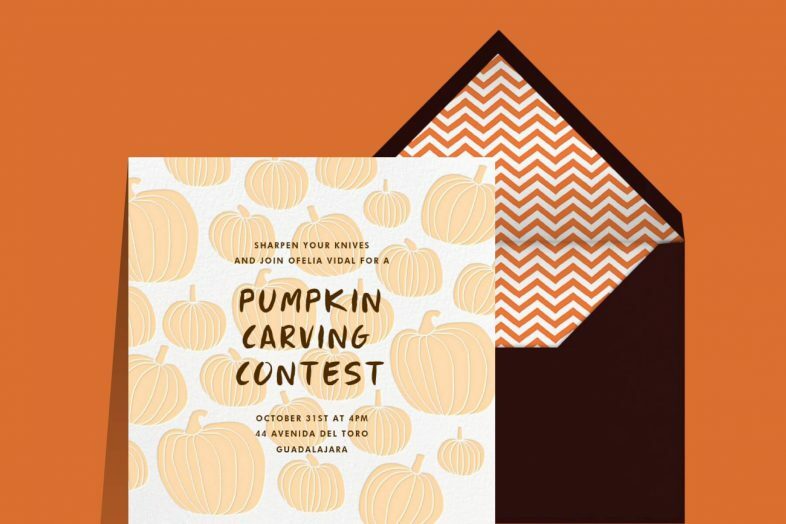 Start your engines for Halloween: browse our sweet and spooky Halloween invitations.